Macaroni and cheese. It's one of America's greatest contributions to the culinary world. This version from is a bit more upscale and Italian in nature. Who cares! It's macaroni and cheese and it's delicious. Give this a whirl next time you want to impress your guests and serve mac and cheese that's fit for a Queen. Preheat oven to 500 degrees F. Bring a large bowl of water to a boil. Combine the cream, 1/2 cup chicken stock, all the cheeses, and salt in a large mixing bowl. Mix well. Taste and add more salt if necessary. Set aside. Generously salt boiling water and add pasta. Cook, stirring often, for 4-5 minutes. The pasta will be parboiled and too hard to eat; it cooks further in the oven. Drain the pasta and add to the mixing bowl, combining thoroughly with the cheese mixture. If it seems too thick, add more chicken stock until the pasta moves freely and is surrounded by liquid. Transfer to individual shallow baking dishes or 1 large shallow baking dish. Bake for 8-10 minutes, or until the pasta is bubbly hot. Serve right away. OH my goodness, this looks heavenly!! Seriously gorgeous!! Just my kind of dish! Looks wonderful - I love gourmet mac and cheeses... and the combination of cheeses in this dish sound perfect! My hubby would love it. So much cheese! That's just how we like it. You had me with the picture of the crusty bread dipped into the pasta! Cheese, pasta and bread is heaven! 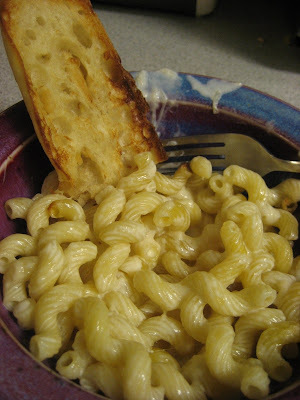 Funny, I was on my way back home and I was dreaming of Mac & Cheese ... Nice recipe! Gorgeous photo! This would be so good for lunch..right now. btw nice blog.. keep it up!! Five cheeses sounds wonderful! Excellent recipe! Thanks so much!! Mac and cheese is easily one of my favorite dishes to make and to eat :) It's just the greatest combination! Hi Victoria, I followed you from the foodieblogroll and I love what you have here! This Mac and 5 Cheese is a wonderful addition to my weekly menu.I'd love to guide our readers to your site if you won't mind. Just add this foodista widget to this post and it's all set to go, Thanks!